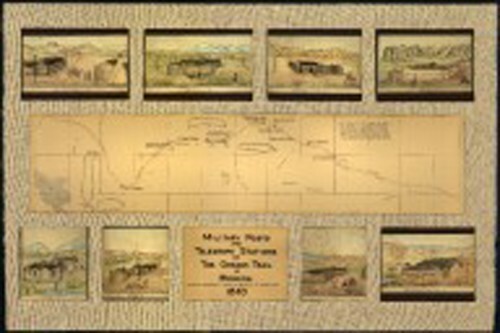 Map and pencil drawings of military posts and telegraph stations on the Oregon Trail in Wyoming. From about 1811-1840, the Oregon Trail was laid down by traders and fur trappers. It could only be traveled by horseback or on foot. By the year 1836, the first of the migrant train of wagons was put together beginning in Independence, Missouri and traveled a cleared trail that reached to Fort Hall, Idaho. Original drawings by U.S. Army 11th Ohio Cavalry soldier, Bugler C. Moellman. Learn more about Fort Sanders and the building of the Transcontinental Railroad.